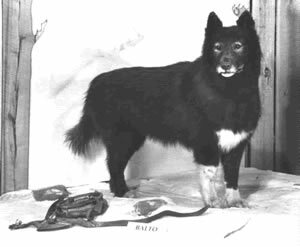 All accounts say Balto was a Husky but he looks like a mixed breed, maybe part Akita. It’s interesting to see that he has a big white “heart” on his chest – illustrating what a big, strong heart he had. Officials quickly decided that a dog-sled relay from Nenana to Nome was the only possibility of stopping the epidemic. They put the serum on the train to Nenana and set up a “pony express” type relay of over 20 village mushers to carry the precious serum the 647 miles from Nenana to Nome as quickly as possible. Each of the villages selected the best sled dogs from every local team to form the fastest, strongest teams. Sometimes teams had to be sent to the villages from Anchorage or Nome. The race went from one village to the next in temperatures that hovered at 40 degrees below zero in blizzard conditions! Radio and newspapers around the world covered the tense situation as the heroic mushers and their dogs raced against time! At each village the fragile cargo was transferred from dog sled to dog sled and they raced on to the next stop through winds of gale force. News of their progress was relayed around the world by telegraph. By the time the serum got to Bluff, 53 miles from Nome, Gunnar Kaasen and his 13 dog team of Huskies, led by BALTO, had arrived in Bluff from Nome. They were ready and waiting to head back with the cargo. They started out through 5a blizzard that was almost a white out. Gunnar, temporarily blinded by the storm, relied on Balto to know where he was going and get them through. At one point Balto refused to go forward and saved the musher from driving them into the Topkok River to sure death. A message was sent by telegraph to have the team stop and wait out the storm in Solomon but Balto raced right by south of the town. The weather was so bad Kaason didn’t know they’d missed Solomon until they were far past and he recognized a landmark. During the worst winds the sled flipped over and the serum flew out. Gunnar had to search for the package on hands and knees in the dark night and blowing snow. He was able to find it and they continued on. When they finally arrived at the Safety Station at 2 a.m., Ed Rohn and his team were supposed to take the last leg into Nome. Ed had assumed Kaasen stopped to wait out the storm in Solomon and was sound asleep. The worst was behind them. Balto and the dogs were in good shape and running well. They were racing to save lives, so Gunnar kept on going and covered the last 21 miles in three and a half hours, delivering the serum safely to Nome at 5:30 a.m. to a hero’s welcome. For two years Balto and other members of his team traveled across the U.S. so children could meet him. When the dogs were sick from traveling, the city of Cleveland raised money to bring them to Cleveland’s Metroparks Zoo and care for them for the rest of their lives. 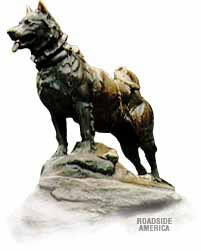 When he died Balto’s remains were put in Cleveland’s Natural History Museum. www.cmnh.org In 1995 Steven Spielberg’s company Amblination, produced an animated movie to tell Balto’s story to new generations of children. ©2008 Barbara Denzer. All rights reserved.